Officially the world’s longest running and most successful tribute to the BBC’s famous sitcom, this Australian original has made its international mark as an ‘unforgettable night out’ (The West Australian). Selling out at shows all over the world – including Sydney Opera House and London’s West End – it’s now returning to Castlereagh Boutique Hotel in June 2019. But be warned: tickets will sell out here too, so early booking is essential! Now performed in around 20 countries a year by 11 teams of actors, Faulty Towers The Dining Experience was born in Brisbane in 1997. Its 2019 schedule includes a wealth of highlights such as Fringe Festivals in Adelaide, Melbourne and Edinburgh; tours across entire continents like Europe, Scandinavia, Asia and Australia; and an ongoing residency in London’s West End. With over 21 years of continuous critical and audience acclaim and close to a million seats sold around the world, it’s clear that this is the most successful interactive comedy show of its kind. Tickets: $120.00 pp for non-members. $110.00 pp for members - $2.20 booking fee included in ticket price. All tickets include a 3-course meal and 2-hour interactive show. 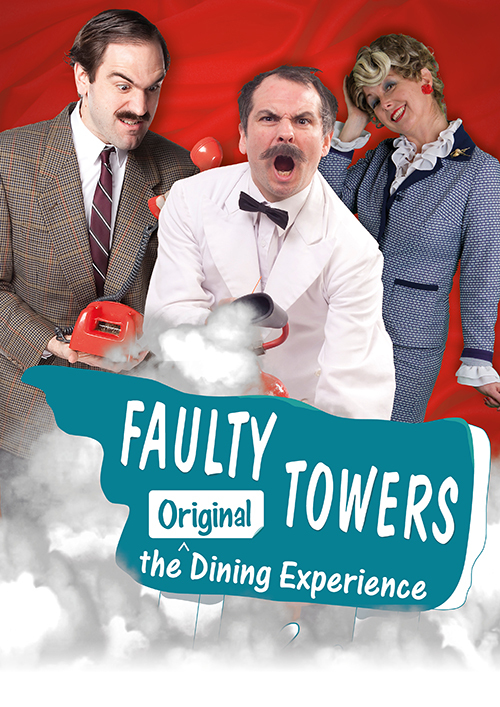 - Faulty Towers The Dining Experience is an affectionate homage to Fawlty Towers, the BBC TV series written by John Cleese and Connie Booth. Their original TV scripts are not used in Faulty Towers The Dining Experience; Faulty Towers The Dining Experience uses its own original script and format. - copyright Interactive Theatre International 2019.